May 9th: Alternative Sauvignon Blancs - where do they fit in? May 6th: Is there a case for sub-regional Marlborough Sauvignon Blanc? Viognier is not popular, according to wine retailer Kingsley Wood. I wonder if it is because people can't pronounce the name 'viognier'? A bit like 'gewurztraminer', in this respect, perhaps. Is it because viognier can be quite alcoholic with flabby acidity and neutral fruit? Wines like this are definitely not special. Or is it because many viogniers are price point expensive compared to current crowd favourite, pinot gris, and super affordable top class sauvignon blanc? When people say they don't like viognier, the reason is sure to be one, two or all of the above. Nevertheless, I am frequently besotted by ethereal versions of this once rare grape. And ethereal versions are out there to be found, savoured and revered. One is Seresin Marlborough Viognier 2009. It was the second of the two Seresin wines mentioned in yesterday's blog entry (below). And unlike Seresin's blended white, this viognier was a match made in heaven with the salmon. A super wine, I've made it this week's Wine of the Week. Click here to read the review. Blended reds are common. There's the Bordeaux quintet: cabernet sauvignon, merlot, cabernet franc, malbec, petit verdot; and the Rhonish trio: grenache, syrah and mourvedre. And in Chateauneuf-du-Pape up to 18 red, white and pink grape varieties could be blended together to make the finished wine! So why don't we hear more about blended whites from around the world apart from sauvignon blanc and semillon blends? Well, here in New Zealand anyway, the wines made from single varieties stand up to be counted on their own - the sauvignon blancs, the chardonnays, the rieslings, the gewurztraminers and the pinot gris. But sometimes it is not all what it seems because, according to our winemaking laws, any wine can have 15% of another variety blended into it without it being declared. That's why pinot gris sometimes has a floral, spicy, musky gewurztraminer-like scent - because there's a smidgen of gewurztraminer in there. Sometime winemakers are proud of the tiny addition, like when viognier is co-fermented or blended with syrah. It's because syrah / viognier blends are trendy right now so they state it proudly on the front label. But what has started to become trendy is white wine blends that don't always seem to have any rhyme or reason. Like blends of chardonnay, pinot gris and riesling! There are a few wineries heading down the blended white wine path now and the prices being charged for some of them make you blink a couple of times, raise your eyebrows and shake your head. $65 a bottle. Really! On Wednesday night, at the First Glass Fine Wine tasting, Stephen Bennett  Master of Wine, wine critic, wine importer and now wine producer, told us about his Marlborough white wine blend, 'Fleur'. Stephen candidly explained how it came about. 2009 vintage dry riesling from one of his labels that hadn't sold as quickly as he would have liked it to, was blended with some 2009 vintage pinot gris that also hadn't sold. Then a little bit of gewurztraminer was added into the blend  hey presto, Fleur is born from the three classic white grape varieties that originate from Alsace. Yes, it's as simple as that, although skill is needed to get the proportions exactly right. That's Stephen, with his impeccable palate, and his white winemaker, Corey Hall. The result: Discovery Point Fleur Riesling Pinot Gris Gewurztraminer 2009. I liked this wine once the chill has been chased away. For my palate it was served too cold and when too cold I can't appreciate all the intricacies that each variety in the blend offers. But a little chilling is okay. It was being sold for a ridiculous $12.99 a bottle on the night. I have reviewed this wine along with others from Stephen's tasting - more Discovery Point wines from New Zealand and some Spanish reds - on my Wednesday Round-up page. On Friday I was to pick up something for dinner on the way home from work, when my husband emailed me to say he had forgotten about a meeting and he would have dinner there. I emailed him back to I would dine on lobster and Le Montrachet. In reality it was fresh salmon and two wines from Seresin that had arrived for review. One of them was a white wine blend. Seresin Chiaroscuro 2009 is made from chardonnay, riesling and pinot gris grown in Seresin's home vineyard in Marlborough. Served at late autumn room temperature, it has a tantalising aroma of lemon bread, freesia blossoms and honeysuckle and the taste is rich, textural and full-bodied with tangy citrus acidity cutting through the creamy mealy backbone. There's an ethereal quality to the wine, which is floral with hints of apricot, rich flavours of ripe fresh pear and subtle oak nuances adding complexity. The grape juices were blended prior to the natural ferment that took place in 500 litre oak puncheons, where the wine remained for 13 months, achieving an alcohol level of 14%. I thought it an excellent example of how these varieties blend together to make a sensational wine for drinking but sadly it wasn't the success I had hoped for with my pan-fried, crispy-skin salmon. As for the price - well it's at the other end of the spectrum - a cool $65 a bottle. A treat! A friend who is an ardent supporter of the wine industry, as a consumer, was aghast when she learnt that wine producers sent me bottles of wine for review. "That will make you biased," she said. "Surely you should be buying the wine." "I'm not a millionaire. It's the way the industry works," I replied. Despite our long discussions, she still thinks that the fact the wine has been sent for review could make me biased. Not surprisingly she has a similar gripe with travel writers. So what would she think of the wine reviewers who were charging wine producers for reviews - and of the wine producers who were handing out the money for the service? No longer just the 'free' bottle of wine, but payment too. 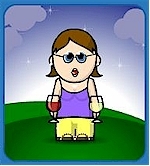 Well, considering that most reviews end up as marketing spiel for the reviewed wine, perhaps the reviewing service should be paid for and judging by the number of reviews on the pay-for-review websites, it's a popular service. It's a win-win situation for the reviewer, whose name gets around, as well as the producer, but are both parties deceiving the consumers? Well, not if the consumers read the reviewer's websites - that fact that payment is required for review is stated there. But does the general consumer know this? Wine producers paying reviewers with the folding stuff is an issue that's been festering within the wine writing community and now Master of Wine in the making, Emma Jenkins, has taken the bull by the horns, so to speak, and hit it on the head. Check out Emma's articles - firstly Declaration of Independence and the follow-up article In For a Penny. I agree with everything Emma has said in the latter. As for the writers charging producers for reviews, Emma mentions two - and these are the two who make it patently clear on their website's FAQs. But she says there are a number of others. Bob Campbell MW has recently added a charge for 'priority' wine reviews - and in the light of the pay-for-review scheme this seems sensible for someone who most probably receives dozens of bottles for review each week. Who are the others? It seems that New Zealand wines have been banned from the Royal Hobart Wine Show, the National Wine Show of Australia and the Royal Perth Wine Show after over 20 years of participation. The reason cited by the Chief Executive Officer of the Royal Hobart Wine Show, Scott Gadd, is that the New Zealand International Wine Show has not invited Australian judges to participate, which they feel has not honoured the original decision to open the Australian show to New Zealand winemakers. The CEO adds, "We believed that efforts would be undertaken to ensure that Australian judges would be invited to participate in the New Zealand International Wine Show in exchange for inviting the New Zealand wine industry to our event. Unfortunately, despite repeated efforts from our end over the past 2-3 years, no such invitations have been forthcoming. " Kingsley Wood, convenor of the New Zealand International Wine Show, established seven years ago, long after New Zealand wine had been accepted into Australian shows, says he has never been approached by any executive from any Australian wine show. And furthermore, he has had Australian judges participating, as has the Liquorland Top 100 and the Air New Zealand Wine Awards. Quite frankly we cannot understand where this is coming from and perhaps NZIWS has been made the scapegoat to cover up the real reason - the Kiwis are simply winning too many of the top awards. With nothing posted for my Wine of the Week last week, this week's selection was posted first thing on Sunday morning for a change. It had to be done then as we were off for a car club trip to sunny Waihi Beach, then we drive north to overnight at the seaside resort town of Whangamata. Actually Whanga is more than just a resort as the off-peak population of 3000+ warrants having a supermarket in town. We drank Georges Road Block Three Riesling 2010 over a week, trying to find a suitable match for this Mosel-styled wine. After chicken cooked various ways, pork and even seafood, it was the Thai takeaways on Saturday night that clinched it. The wine's acidity cut through the oiliness while the sweetness cut through the acidity - everything was good all round. And I loved the way this wine developed in the bottle - all the hallmarks that it's going to be a great Riesling to cellar. Check out my Wine of the Week review here. My brother, at whose place we stayed in Whanga, opened a delicious red from Esk Valley. Although I didn't write any notes (you have to holiday some time), I can say that Esk Valley Hawkes Bay Merlot Cabernet Sauvignon Malbec 2009 is a super wine. The after dinner accompaniment to Up and Down the River, the family's number one game of cards, the wine, like my brother at the card game, was a big winner. Someone left an old book and a bottle of wine for me. Who left it? What was the wine's provenance? And why the book, Rabbits Galore? The wine, Lansdowne Estate Pinot Gris 2009 had a website on the back label - www.lansdownewine.co.nz - but the webpage stated only the name and 'under construction'. It was a mystery I had to unravel and searching the Internet didn't help either*. All the clues were in my hands and most came from the label. It told me Lansdowne Estate is in Masterton in the Wairarapa and was producing world class pinot and syrah in 1895. Romeo Bragato visited Lansdowne during his wine region travels and praised the Wairarapa for being eminently suited for the culture of vitis vinifera vines. But Lansdowne Estate's original vines were pulled out in 1908, during prohibition. Lansdowne Estate as it was back then, was a huge land holding. Now it's all subdivided up, it lends it name to a suburb of Masterton and a golf course. And in 2004, on one of the rural blocks, grapevines were once again been planted. The book had its flap inserted to bookmark a photo - a photo of the Brancepeth Homestead, owned by a Mr H Beetham, presumably a descendant of the region's original winegrower, William Beetham. Click here for a photo of William Beetham's vineyard at harvest time. William Beetham is 4th from the left. Ah, now it's starting to make sense. 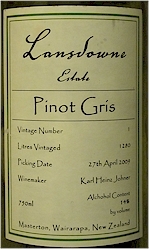 Lansdowne Estate Pinot Gris 2009 is a pinot gris with a difference - and that's not a bad thing at all. A crisp, fresh gris with apple and pear aromas that carry through to the dry, clean palate, it has a touch of spritzy sherbet, but all the while the sweet juicy apple flavours take centre stage with strudel spices, creaming soda and a nuance of vanilla adding complexity. More of a 'grigio' style, I'd say - high acidity seems to be the driver. It's the first crop off the vineyard and Karl Johner (Johner Estate) made the wine. It has 14% alcohol and a screwcap closure. It developed beautifully in the bottle and we tried it with a couple of food bites that worked very well. Firstly crispy duck skin as a pre-dinner nibble, and later pork marinated in apple juice and maple syrup. The next mystery to unravel is 'how much does is cost?" and 'where to buy?' If anyone knows, share the secret. *Searching the Internet, I did find reference to other Lansdowne estates and vineyards, both here and overseas. It's evidently a popular name. Tried these 2008 vintage Rieslings recently - and they are all drinking beautifully. Astrolabe Voyage Dry Marlborough Riesling 2008, $22, is citrine in hue with a tantalising scent of honey, oranges, flowers and pollen. Bright acidity indicates this is still a baby, with a long way to go, yet the rich weighty palate says, 'I'm grown up already.' It's fresh and rich with nuances of spice and a huge tingle of zest on the finish. I can see this hanging in there for quite some time and it won't disappoint in another three years time (6.5g/L residual sugar, 13% alcohol). Julicher Martinborough Riesling 2008, $19.95, is a little more delicate than the Astrolabe with an earthy, petrichor aroma - it smells like it is going to taste searingly dry but the flavours of lemon, lime, ginger and tarragon are rounded and balanced and the whole experience is beautifully harmonious. It's stunning right now (11.9g/L residual sugar, 13% alcohol). The above two wines were tasted at home and enjoyed with firstly a smoked fish pate and secondly with furikake and panko-crusted pan-fried terakihi. Julicher had the slight edge when it came to the food. Isabel Dry Marlborough Riesling 2008, $22, has a gorgeous aroma of coconut and lime, and a honeyed richness to the warm, weighty palate with malic-like acidity emerging on the finish (2g/L residual sugar, 13.5% alcohol). Fiddler's Green Dry Waipara Riesling 2008, $26, has a concentrated and rich aroma of lime and dried tropical fruit and while the label states 'dry', the honey-like flavours add sweetness and the finish is full of refreshing zest (5g/L residual sugar, 12.9% alcohol). Fiddler's Green Classic Waipara Riesling 2008, $24, seduced me - delicate honeysuckle and citrus cream aromas with some toasty nuances too and a rich, rounded, weighty palate with lemonade citrus and tropical fruit. A medium style, it's showing very well right now and finishes clean. My favourite from this tasting (11.5% alcohol). Glasnevin Classic Waipara Riesling 2008, $26, is at first a little restrained and flinty on the nose then toasty nuances come through and the flavours are luscious and fruit driven with blossoms, honeysuckle, a touch of toffee and a creamy texture with a flinty character emerging as it lingers. Made by Fiddler's Green (9.5% alcohol). Masterchef inspires me. Well, the master classes in the Australian series do. Especially Junior Masterchef being screened on Monday nights on Prime. After last week's episode I know how to make vanilla yoghurt pannacotta with a jelly layer. The 9 to 12-year-olds, in the cook-along master class, made it look so easy. Strangely, however, when NZ Masterchef Finalist, Nadia Lim, [edit: now Masterchef winner*] did something similar, she was told it was too complicated to put in her cookbook! And that's after the master classes that introduced the contestants to very 'cheffy' techniques. I haven't been too inspired by the NZ Masterchef master classes as the recipes are too complicated and too time consuming  and where do you get even half of those ingredients? I found duck the other day at the local Pak 'n Save. They must be going upmarket, as I don't think I've bought duck from them before. Actually I stopped buying duck after an unfortunate experience in February 2008. One of the breasts had not been plucked properly and the skin side of the breast felt like it was covered in prickles, like it had fish bones sticking out. The producer's representative assured me that a replacement would be arranged but it never happened. So duck has been off the menu since then. Thankfully the duck breasts I bought last week were free of feather quill remnants. I decided to modify a recipe I saw on the first series of Australia Masterchef, being repeated on Saturday mornings, which MySky automatically started recording for me. It was a pork belly and scallop dish with a mouthwatering sounding orange star anise sauce. This sauce would be the hero of the dish, although I substituted red onions and leeks for shallots and added a little sugar to the sauce because the first of the season's oranges off my tree had a bracing acidic edge. While the pork belly had been cooked sous vide, but without any special equipment, I decided to cook the cinnamon / sugar / salt-seasoned duck breasts to the producer's instructions. The end result is that they were very tender. Omata Estate Syrah 2009 is made from grapes grown in Russell in the Bay of Islands. In the glass the wine is a vivid boysenberry red and has a rich ripe aroma of concentrated berry fruit and lashings of black pepper while emanating a smooth impression of vanillin oak. Ripe and juicy to the taste, this savoury, tarry, peppery Syrah has a beguiling rose spice character together with dark fruits and a lifted brightness to the finish. I always knew Northland could produce great Syrah and this is a terrific example. It has 13.5% alcohol and a screwcap closure. According to the Omata Estate website it costs $39 a bottle. Cheers! * Congratulations to Nadia for winning NZ Masterchef. She was one of my favourites from the start. If one company can do it, why can't others? I'm talking about gold medal quality Marlborough Sauvignon Blanc for $10 a bottle at a fine wine store! There should be more of it. Like the one we tasted last Wednesday at the First Glass Fine Wine Wednesday tasting. Dusky Sounds Marlborough Sauvignon Blanc 2010 and this is a beauty. It's Sauvignon Blanc as I like it. One of the labels that comes out of the Waipara Hills stable, it's a blend of both Wairau Valley and Awatere fruit, It's juicy and tasty with everything you associate with Marlborough  passionfruit, gooseberry, lime and grass with the ripe fleshy tropical fruit balanced by racy acidity. The big star on the night was Spy Valley Envoy Marlborough Chardonnay 2007  four years on and no sign of premature aging  just cruising along as it will be for a long time. It's one of those smooth, malty, creamy wines packed with flavour and a long lasting finish. I tasted this about 18 months ago but then I thought it was too oaky, but I wrote in my tasting note there was so much going on behind all that oak. - fresh peach, melon and nectarine with an infusion of kaffir lime and vanilla. Well now the oak has mellowed and those background players are centre stage. It's quite magnificent. I also loved the Wooing Tree Beetlejuice Cental Otago Pinot Noir 2009. This wine is the best under the Beetle juice label yet, and that's saying something because past vintages are all gold medal winning wines. Oh hang on, this has also won a gold medal too. I tasted this about six months ago and was totally impressed. And it impressed again tonight. From its saturated ruby colour and its alluring aromas to the juicy succulent flavours supported by plush velvety tannins, it's another star from this Cromwell vineyard and drinking beautifully right now. Check out all the notes from the tasting on my Wednesday Roundup page. The new wines arrived for tasting and I have to say that when I saw the labels, I was impressed. Colourful and catchy to the eye, they tell a story too. According to the Maori dictionary, 'takutai' translates to sea coast, coast or shore and the graphic on the label is part of a sea chart. However according to the back labels of these wines, it means a place with a coastal connection, even if 150 kilometres inland, which is about the furtherest away you can get from the coast, as the crow flies, in New Zealand. I'm sure everyone who lives in our long narrow islands has some kind of coastal connection. Takutai is one of Waimea's brands and the grapes are grown in Nelson. Full retail is around $16 a bottle. A juicy, lightly-oaked Chardonnay with fruity aromas of stonefruit and mandarin and a touch of butterscotch sweetness to the stonefruit flavours with a mealy savoury twang, a subtle oak nuance and a sweet lift to finish. Soft and easy-going, the kind of Chardonnay to chill well and enjoy for what it is. Don't think about it. Just drink it. 3 stars. An aromatic and sweetish wine, with some musky, gewurztraminer-like flavours coming through. Soft and easy but just a little cloying when tasted at room temperature. When chilled it has more characteristic pear with honeysuckle and apple aromas and a fatness to the palate. Chilling subdues the musky-like flavours, spice and zest are enhanced and the finish is phenomenal with its long, spicy hit. 3 stars. When New Zealand's leading wine educator and most sought after wine critic is the guest presenter at a tasting, you can be sure there will be some special wines. Well, there were at the First Glass tasting last Wednesday when Bob Campbell MW came along to host the second of the Master of Wine Series. There were wines from producers named in his most exciting up-and-coming producers - Misha's Vineyard, Pyramid Valley and Man O War. But the biggest treat was Chateau Rieussec Sauternes 2003. Like how often do you get to taste that? And at a $15 tasting!! Apart from the Sauternes, my standout wines on the night were Misha's Vineyard Limelight Riesling 2010 from Bendigo in Central Otago, and the funky wild yeast-fermented Pyramid Valley Lebecca Riesling 2007 from Marlborough. Then there was the gorgeous Spy Valley Marlborough Gewurztraminer 2010 and I continue my love affair with this variety. In the reds were two pinot noirs that showed why the nation has a love affair with pinot. 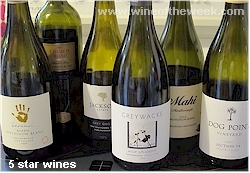 Julicher 99 Rows Martinborough Pinot Noir 2009 is a juicy succulent number but I also adored the Valli Bannockburn Central Otago Pinot Noir 2008 - this was tasted again to earn the status of this week's Wine of the Week. And finally the Cien y Pico 'Doble Pasta' 2007 from Manchuela in Spain. Made from a grape that has red flesh, as well as red skin, this was a pleasing mix of old world and new. All of my tasting notes from this excellent tasting are available to read on my Wednesday Roundup page - click here to go to the 4th of May. Alternative Sauvignon Blancs - where do they fit in? Seresin Marlborough Sauvignon Blanc 2009 ($27) - although a little subdued on the nose with only hints of grass and tropical fruit, this is a rich, fat wine in the palate with fleshy peach, juicy tropical fruit and loads of zesty pineapple. It's warm textured and creamy with lively acidity ensuring a bright finish. 95% Sauvignon Blanc and 10% Semillon. Certified organic fruit. 80% wild ferment. The Semillon and 10% of the Sauvignon were fermented in old oak. 14% alc. Mahi Marlborough Sauvignon Blanc 2010 ($20) - maybe a rogue in the lineup as it doesn't taste too oaky or leesy at all. The aromas are all grass and green bean and the powerful flavours are stonefruit, citrus, apple and bean. The mouthfeel and texture are rounded and the finish is bright and zingy. The riper hand-picked portion of the fruit was fermented in both oak and tank, all with wild yeast. Remainder cool fermented in tank and held on yeast lees for 3 months. 13.5% alc. Jackson Estate Grey Ghost Marlborough Sauvignon Blanc 2009 ($30) - really creamy smelling, tropical, complex, I like this scent. A full-on alternative style with a profound savoury bent. Initially there's a pear-like texture but there are no pear flavours at al. It's earthy, it's funky, sweetness wells up from within and a cherimoya fruitiness and creaminess and a touch of hokey pokey, then the acidity kicks in. Texturally complex with impeccable balance, it has layers and layers of finesse. And then, on the finish, there's a suggestion of spritz and a touch of orange zest. 13% alc. 5 stars. Seresin Reserve Marlborough Sauvignon Blanc 2009 ($55) - one of the most interesting wines of the tasting. It seduces from the outset with its smoky, creamy, mealy perfume and an underpinning of freshly cut grass but when first tasted it seems quite lean. It walks a straight line down a flinty gravelly path but then it sticks a hand out here and a hand out there, it swings its hips and suddenly there's life and laughter all around, Sweet stonefruit, honeyed citrus and distinct wild yeast traits build to a bright zesty finish with citrus, tarragon and subtle creamy lees the lasting impression. Certified organic. All wild yeast fermented: 70% in tank, 30% in aged French barriques. On lees for 5 months.13% alc. 5 stars. Dog Point Section 94 Marlborough Sauvignon Blanc 2009 ($32.95) - juicy freshly squeezed grapefruit with a smoky nuance coming through. Grapefruit also abounds in the palate of this earthy savoury style that has a sweet toasty oak influence, a hint of tobacco and bright acidity with a pineapple zing  fulsome, satisfying, lots of oak and the creaminess of the yeast lees balancing the zing. Spicy and powerful. Fermented in older French oak barrels with wild yeast and left in barrel on lees for 18 months. 13% alc. 5 stars. Greywacke Wild Sauvignon 2009 ($37) - hints of asparagus and smoky bacon too. Smells a little different to the others but the palate is more in line. It's smoky and savoury with pineapple, herbs and sweet pea and that intriguing sweetness coming through. Fills the palate and leaves the tastebuds with memories of pleasure. Soft and easy  a delight to drink. Fermented in old oak barrels using wild yeast. 13% alc. 5 stars. Church Road Reserve Hawkes Bay Sauvignon Blanc 2010 ($37) - in a Bordeaux bottle, it certainly seems like an 'alternative style' both in bottle and taste. Creamy scents are infused with passionfruit, vanilla and corn. Plenty of oak. Originally tasted alongside non-oaked wines but would be been good with the alternative wines too. Texturally complex, good flavours, long finish.14.5% alc. 5 stars. With so many outstanding wines in the tasting, it was hard to come to a conclusion as to what was my favourite. You try the wines. You decide. Is there a case for sub-regional Marlborough Sauvignon Blanc? This is the dissertation topic of Master of Wine student Emma Jenkins and I was flattered when she asked me what I thought. However I'm not sure if my answer was helpful. I told her perhaps if the grapes were all picked at same Brix level and winemakers all used the same yeast strains, oak / no-oak regime, time on skins, time on lees, etc, etc., it would be easier to see sub-regional differences. But with the seasonal influences on picking and winemakers whim factored in, not so easy. And the other thing is what delineates each region? The winegrowers commonly talk about northern Wairau Valley, southern Wairau Valley and the Awatere Valley but both the Wairau and the Awatere are long valleys with rivers running west to east. After driving the length of both valleys last last year, and seeing grapes being grown on the coast as well as at high altitudes some 50 kilometres inland, I wonder if the sub-regional lines are drawn in the right places? Blind tasting the wines that Emma had selected, in various combinations, was an interesting exercise. In total she had three wines from the Awatere Valley, three from the Wairau Valley and three that were a blend of two. Looking at my notes afterwards, the upshot was I couldn't tell the difference and at times I couldn't even pair two from the same group together. Is this because I'm a poor taster (maybe) or that the wines showed more similarities than differences (possibly). Here are three that stood out, for various reasons. Vavasour Marlborough Sauvignon Blanc 2010 - made from Awatere grapes grapes grown near the coast. This is the only wine that showed any tomato leaf character that I commonly associate with the Awatere, but it's an attribute I often associate with Vavasour too. Perhaps a leaner, more citrussy style that some of the other wines in the tasting, a pleasing underlying herbaceousness too. Craggy Range Old Renwick Marlborough Sauvignon Blanc 2010 - this is from the Wairau, but because it seemed quite flinty, dry and lean with nettle-like characters, I associated it with Awatere! Saint Clair Wairau Reserve Sauvignon Blanc 2010 - from the lower Wairau. Twice I wrote 'nice! ', which means I really liked this wine. It's a fuller, fatter style with juicy tropical fruit and underlying grapefruit that brings it all into balance. Both Craggy and Saint Clair were in the Wairau trio - but they were quite different to me. I look forward to Emma's conclusions when her dissertation is finished and wish her the best of luck in this final step to attaining her Master of Wine qualification. Watching the Royal Wedding on my television set, on the other side of the world from where the events were happening, I thought how stunning Catherine's bridesmaid / maid of honour and sister, Pippa Middleton was. But the commentators of the TV channel I was watching, hardly gave her a mention. That's because Catherine was the star of the show and Pippa's beauty and presence was downplayed. I feel it's like that at wine shows, when the stars are predictably the chardonnays, pinot noirs and syrahs. Gewurztraminer gets its share of gold medals, but is always one of the bridesmaids when it comes to comes to champion of show. Its beauty is downplayed to stage left or stage right. It's there, but out of the spotlight. But some of us know what a star this variety can be. I do, that's why I drink it whenever I can and rave abut the ones I really like. Like this week's Wine of the Week: Distant Land Marlborough Gewurztraminer 2010. Click here to read my review. May Day and as the lyrics of the children's song say, time to gather nuts. And it's true, you can gather nuts in autumn in New Zealand and sometimes on a cold and frosty morning, especially towards the end of the month. But it is not cold and frosty yet, just wet, wet, wet. The other night, albeit an April night, there were plenty of nutty expressions in the Cuisine Top 10 Chardonnays tasted at First Glass. The nutty flavours come from the yeasts and the oak. As I think about the nuts I tasted in Chardonnay, there's been hazelnut, cashew nut, macadamia nut and creamed nuts, the last being when nuts have been pummelled into a paste in a mortar and pestle. I don't like drinking Chardonnay when it is too cold and so I was relieved to find the Chardonnays were served at the perfect temperature - just very slight chilling is all that is needed for the wines to show off their glorious expressions. And glorious some of these wines were. I think the judges must have had a difficult time coming to a consensus for their number one. This is the order they finally decided on. The No. 1 wine, Villa Maria Barrique Fermented Gisborne Chardonnay 2009 was magnificent. So also was the No. 8 wine, Villa Maria Reserve Hawkes Bay Chardonnay 2009, the Champion Chardonnay at the Air NZ Wine Awards last November. But on the night it was the Vidal Reserve Hawkes Bay Chardonnay 2009, Champion Chardonnay at the Royal Easter Show Wine Awards in March, that I picked as my favourite. A little sweeter perhaps, with Mackintosh toffee and creamy, buttery biscuit flavours. Rounded, seamless. Yum, yum, yum, yum, yum! To check out all my notes from the Cuisine top 10 Chardonnay tasting, which we tasted in random order, click here.